When we were growing up, my mom put a homemade dinner on the table almost every single night. There were very few exceptions (like car trips and the occasional pizza night), but on Sundays, my mom took the night off. And we had popcorn and ice cream for dinner. It was the BEST tradition! We looked forward to it every week and as a mom myself, I can really appreciate how nice it is to take a night off every once in a while. In the last year or two, I’ve done my own version. We call Sunday our “leftover night,” and we clean out the fridge. It’s a hodgepodge mixture of different meals from the week, so sometimes that means that what’s left doesn’t really go together (teriyaki stir fry and pasta with marinara) or provide a lot of nutritional balance (polenta, rice, and roasted sweet potatoes). So, instead of ice cream, I supplement Sunday dinner with smoothies. 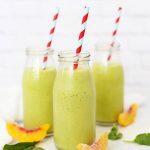 Smoothies are a great way to add a little nutrition boost to the day, and (to my kids) when you sip them through a fancy straw, they feel like a big treat. 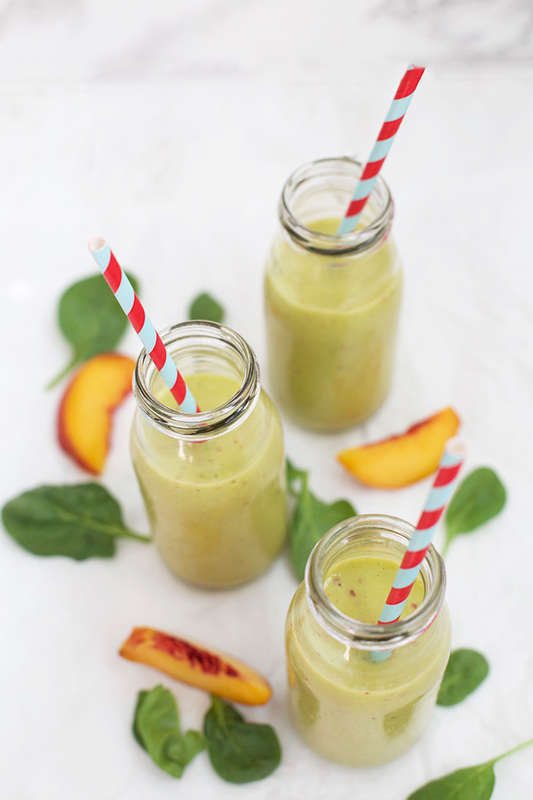 This pineapple peach smoothie is always a MAJOR hit. Milo and Sophie think it is THE BEST. Milo will drink almost any smoothie out there (Sophie is more hesitant), but this one is a hit with both kids and both adults. Both kids have even been asking me to make it for snack a few times this week. It’s so good! 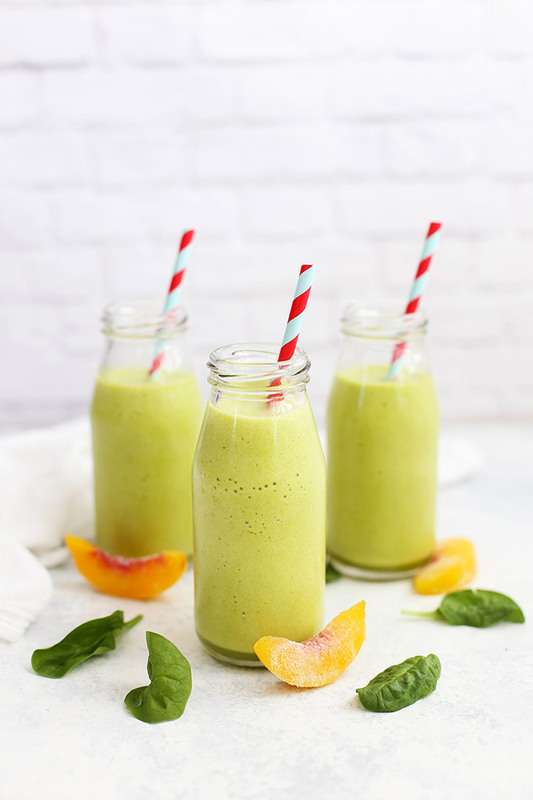 There’s brightness, sweetness, a little bit of tartness, and a little extra nutrient boost from the spinach and collagen peptides. It’s also not as BRIGHT GREEN if you’ve got little ones who are still suspicious of green things (like Sophie is). 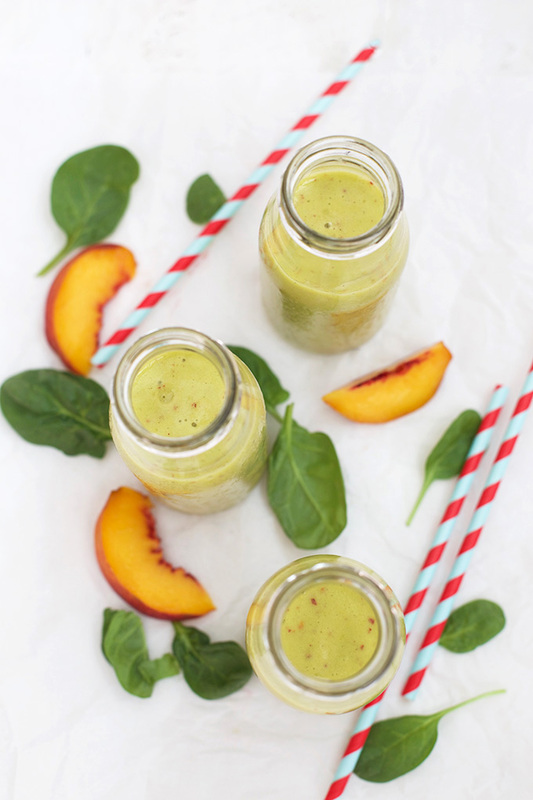 It’s another great smoothie to add to your arsenal for breakfast and snack. Or, you can add a side of popcorn and call it Sunday dinner. I won’t judge. But I’m vegan/vegetarian. No problem. Chia or hemp seeds are my go-to plant protein boost. Besides their healthy fats, 2 Tbsp of chia seeds have 4g of protein and 11g fiber. 2 Tbsp of hemp seeds have 9g of protein and 2g of fiber. Frozen or Fresh? 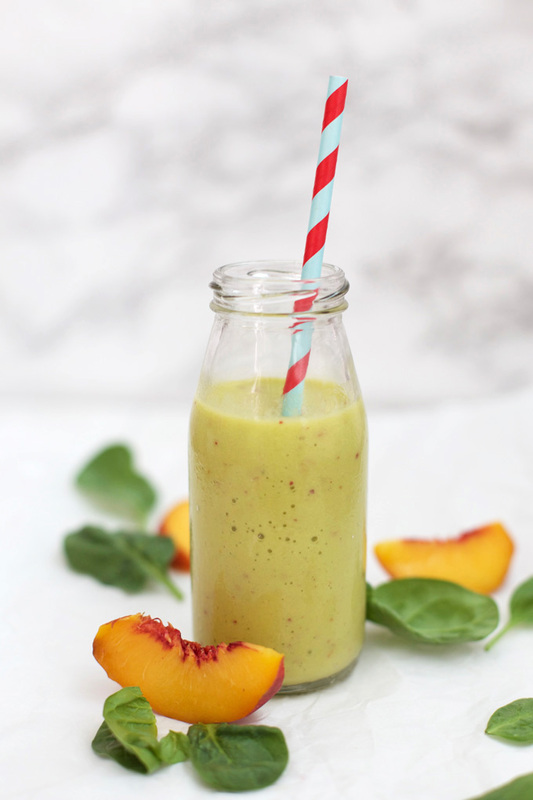 You can use frozen or fresh fruit (or a combination) for this smoothie. If I’m using all fresh fruit, I like to add 1 cup of ice for a frosty finish. Have Leftovers? This makes AWESOME popsicles. We pour leftover smoothie into a popsicle mold (this is our favorite) and freeze for about 3 hours. Boom. Perfect, refreshing, healthy snack! 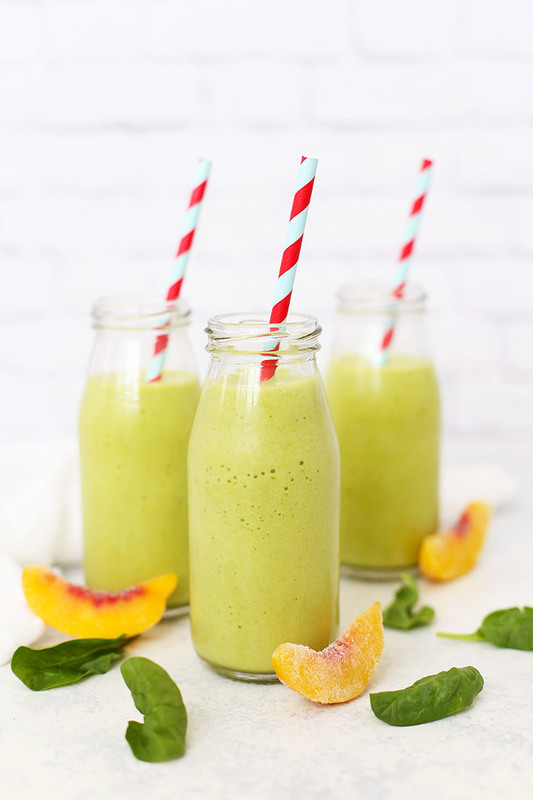 You can use fresh or frozen fruit for this smoothie. If you use fresh fruit, I like adding 1 cup of ice for a frosty finish. Place all ingredients in a blender. Puree until smooth, adding more water or orange juice as necessary. Recipe & post updated May 2018. Originally posted Aug 2016. Ooh, I’m excited to make healthy smoothies for breakfast again. 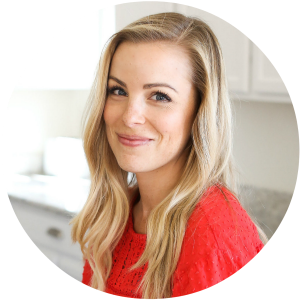 Definitely pinning this recipe!! That is SO awesome that your mom used to make a home-made dinner almost every single night. My mom does the same thing, and I SO miss living at home!! Nowadays, I live alone and have to fend for myself! Making dinner is such a challenge!! Lisa – it REALLY is a challenge! I totally took it for granted growing up! My boyfriend is a great fan of smoothies. I buy a kg of strawberries for him each day since they showed up and he drinks it mixed with dairy (although a very specific one I don’t think exists anywhere else than in my country). I love it and I’ll make sure to try it out. I am a little hesitant though, cause it’s a little hard to buy fresh pineapple here and the canned one has so much sugar. I love it! My mom, also, had home cooked meals on the table every night. Sunday night dinner for us was popcorn and my dad’s homemade grape juice. I’m almost seventy and a great grandmother; my favorite dinner “night off” from cooking is still popcorn! Oh, that sounds so wonderful! I love it!